Mission 7 is out! I’ll update the guide tomorrow, I’m too tired right now. Here are some pictures instead. EDIT: I’ve updated the mission guide. If you need help, go check it out. It has Aunt Artic’s initials in the corner. Ooops, I’ve said too much… (sadly that wasn’t a joke). If you’re smart you might be able to figure out what I just said, but if you do, please keep it to yourself. 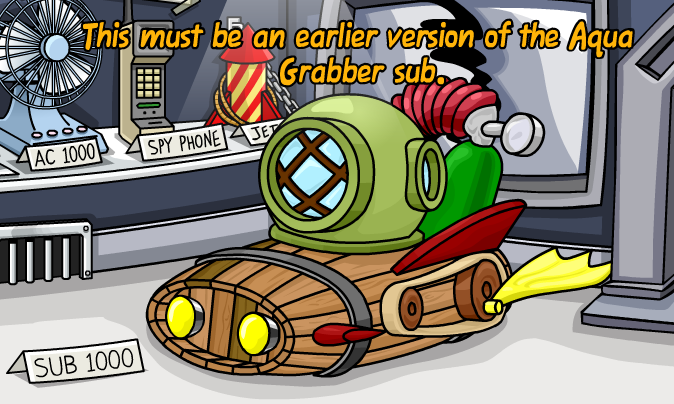 The original Aqua Grabber has been added to the Gadget Room. I’d hate to be the penguin testing it. 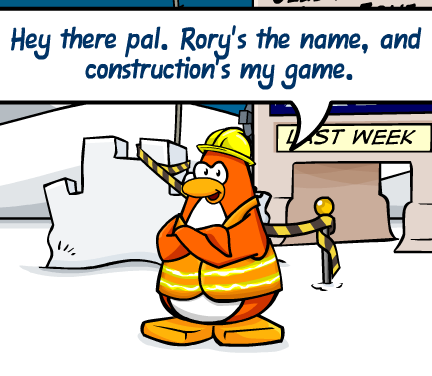 In this mission you meet some famous characters like Rory the Builder, & the first yellow puffle ever seen that lives at the Stage. 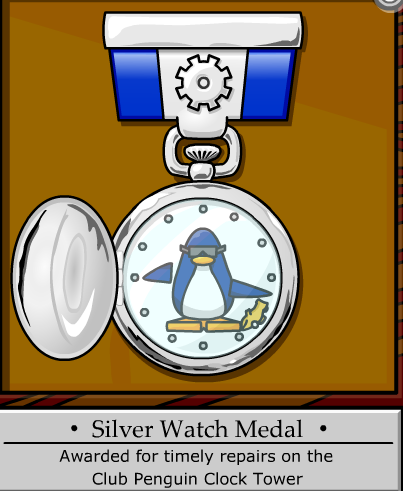 You also get a cool medal that has a working watch inside it! Now you can tell the time without going to the Snow Forts! It even tells seconds. 😀 But scrolling down to the very bottom of my inventory takes a lot longer than just going to Snow Forts. 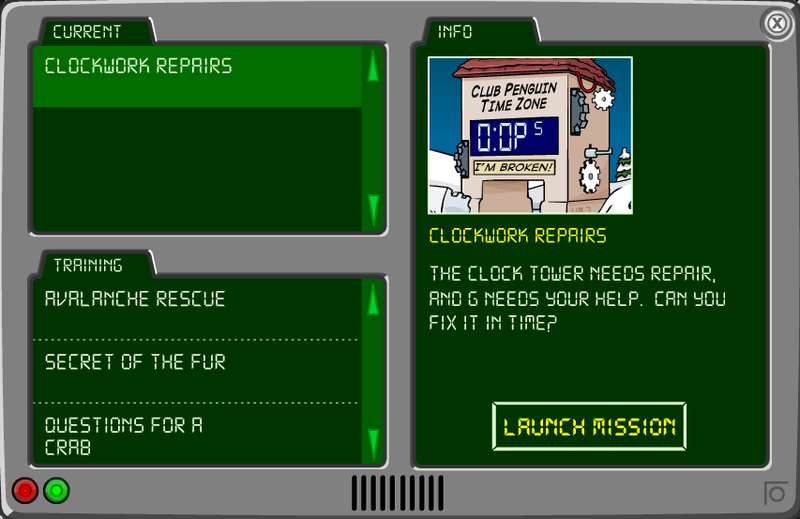 Well, it will have to do while the clock is still broken (yes, even if you complete the mission it’s still broken). Don’t forget to check out the Thingamajig 3003 in the Gadget Room too! It’s that time again; time to use all the clues I’ve gathered to get a pretty good idea of what something is gonna be. Today I will be researching the “Tester Item”. 1. As most of you that tested the new servers for CPIP know, there will be a reward for those who helped. The second time Billybob mentioned it, he said they will need one of the new features to “deliver” it. I believe they are working on a program that will preform a mass “delivering”, which means they are making something that can give all the testers the reward. Since non-members can’t access their storage box, I highly doubt it will be a furniture item of some sort. So, in my opinion, it will be a clothing item. How far we’ve gotten: Ok, so now we know it will probably be a new item. 2. Ok, let’s look at the last server test for some clues. Well, thanks to some older players, I’ve found out that the reward for testing last time was the Black & Pink Toques. 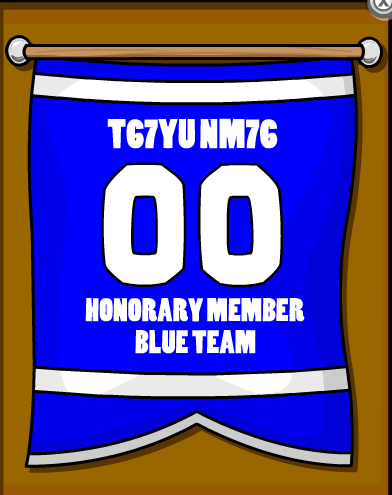 But I’ve also found out that those two clothing items returned in a catalog, but for members only. Hopefully this reward won’t return. How far we’ve gotten: The reward may return & there can be more than one item. 3. Ok, let’s look for leaks. The only leak I was able to find was some guy in Mammoth telling everyone that the items will be orange & grey toques. This is not solid evidence, it’s just some gossip I picked up from the MCCP forums. How far we’ve gotten: The reward may return, there might be more than one item, & it could possibly be grey & orange toques. 4. Now let’s look at other ideas. Mr Squeakens suggested it might be loads of coins, like one of the rewards all beta testers got. I find this a very good idea, but I hope it isn’t; I can get coins easily by myself. How far we’ve gotten: The item may or may not be (a) clothing item(s), it might return, there could be more than one, & there’s a possibility the reward is grey & orange toques. That’s all the clues I’ve got. Share your ideas or any clues you might have heard here.